Dr. Tom Young and Dr. Patricia Dove (left to right) brief policymakers on the 2018 Summit. 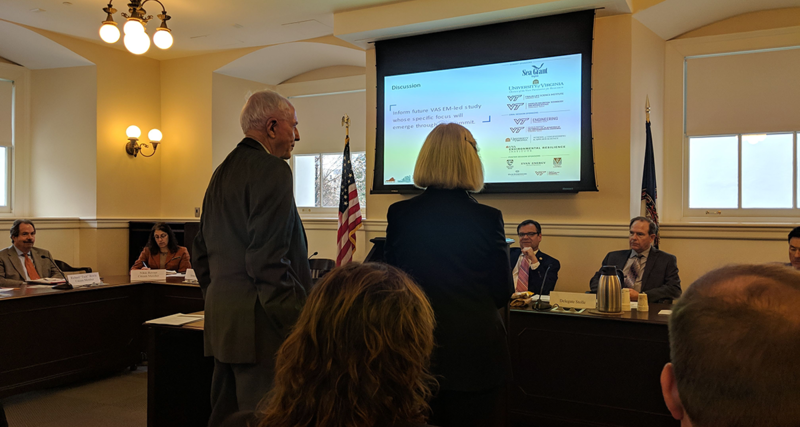 At the request of State Senator Lynwood Lewis, Dr. Patricia Dove and Dr. Tom Young presented to the Joint Subcommittee on Coastal Flooding at the Virginia State Capitol on January 7th, 2019. The 20-minute presentation provided policymakers and the standing room only crowd with the goals and format of the 2018 VASEM Summit on Securing Prosperity in the Coastal Zone as well as the broad capabilities the VASEM can bring to bear on issues important to the Commonwealth. The Joint Subcommittee on Coastal Flooding is comprised of seven legislators and three citizens appointed by General Assembly leadership. Originally formed in 2014 and updated in 2016 by HJ 84, the subcommittee is tasked with providing short-term and long-term strategies for minimizing the impact of recurrent flooding and coastal storms. Co-Chair, State Senator Lynwood Lewis addressed the 2018 VASEM Summit on Securing Prosperity in the Coastal Zone and requested VASEM to present to his colleagues. Summit co-chairs Dr. Jennifer Irish and Dr. Robert Weiss are currently working abroad on international coastal issues and were unable to attend in person, so VASEM President Dove gave the presentation. Also presenting at the Subcommittee hearing was Admiral Ann Phillips, the special assistant to Governor Northam for Coastal Adaptation. Admiral Phillips provided a keynote to the 2018 Summit on Securing Prosperity in the Coastal Zone.